One of several valleys that cut into the southern Humboldt Mountains. 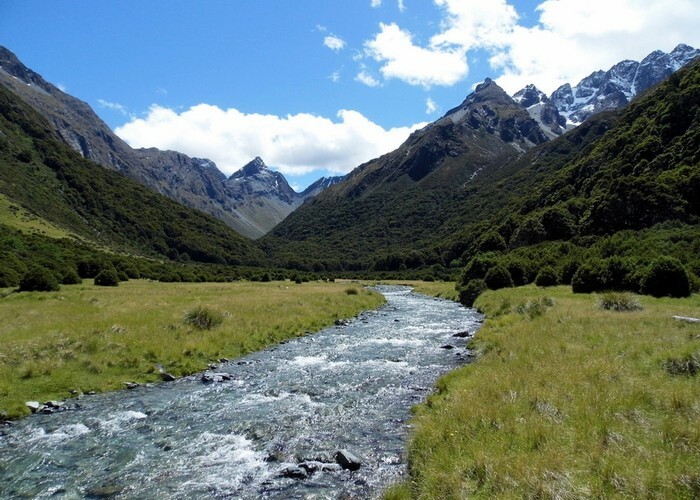 It passes through many kilometres of beech forest, river flats, and scrub above the bush line. 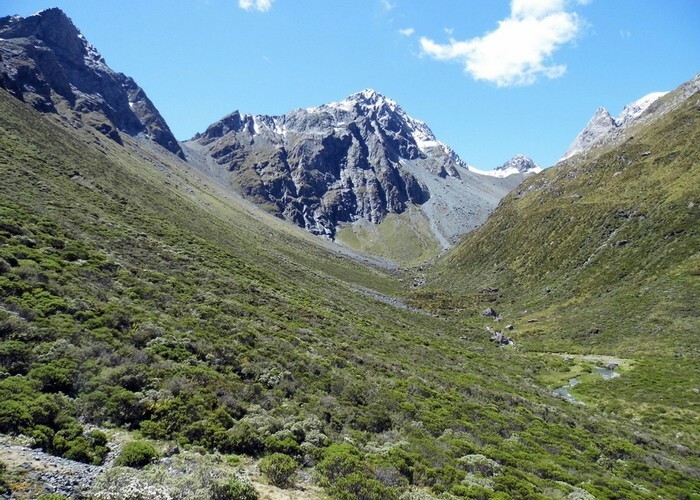 An alpine pass (Fraser Col) at the valley head gives access to Lake Mackenzie via Emily Pass or the Routeburn between Falls and Flats huts via Emily Creek. Fraser Creek flats • By Yarmoss. Licence: C.
Fraser Creek/Kay Creek track junction. From the Caples track a sign post points the way down the hill to a swing bridge over the Caples River where, just inside the trees on the other side, a track junction points the way to the Fraser. A sign post on the Caples Track points the way down the hill towards the river, a newly rerouted track skirts some large windfall before dropping down to the swing bridge over the Caples River. 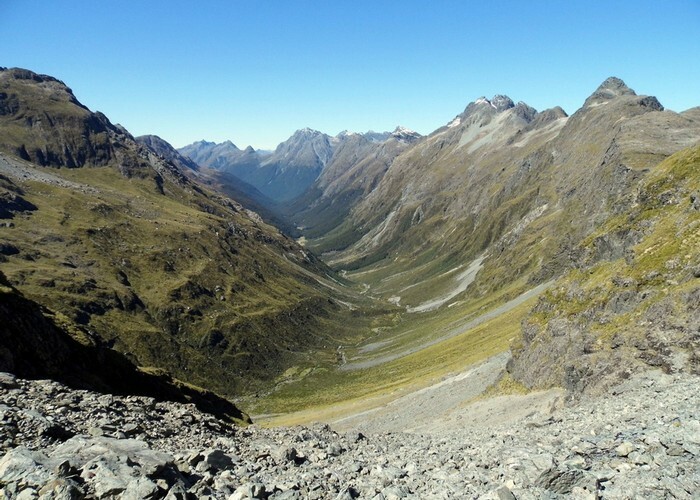 More experienced trampers might remember when the track used to swing past the Upper Caples hut but all of this was rerouted about 2015/2016 when Upper Caples was sold/given to the NZDA. Once over the swing bridge and across the small flats on the true left of the Caples, the track pushes into the trees where a junction is soon met. To the right goes the Kay Creek track, to the left Fraser Creek. Turning left the track is followed up a small hill which takes you above the lower reaches of the Fraser before dropping you down to river level. The track mostly follows the river bank for the rest of the journey up the Fraser. There are at least 9 crossings of the Fraser up to the bush line, most of them knee deep at worst under normal flows, however any flooding will make the crossings impassable. Numerous clearings and river flats are passed through on the way up the valley, each one nicer then the last. 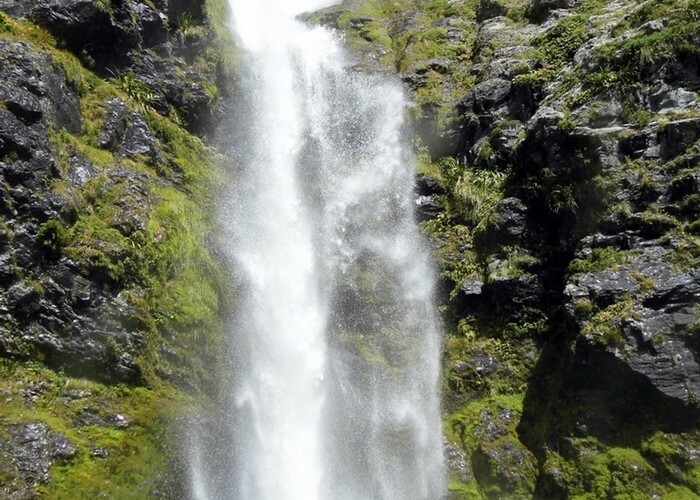 The flats that begin at CB09 209 286 are stony and have thick waisthigh regenerating beech forest at their head, but are remarkable for a huge 80m waterfall which tumbles out of a hanging valley above. Its well worth fording the Fraser here and climbing up to admire the falls from underneath. Fraser Creek Waterfall • By Yarmoss. Licence: C.
After two more patches of bush and another large flat the markers end at CB09 208 310. Yet another pleasant flat meanders up valley a short distance. At the head of these flats, thick belts of alpine scrub close in, chocking off the valley. There is no way around the scrub, the best travel to be had is in the creek, rock hopping upstream and crossing back and forwards to avoid boulders, undercut river banks, and scrub as required. You cross the creek another dozen times at least from the bush line to the base of Fraser Col (Point 1544). Older maps show a rock bivvy at about CB09 203 325. This does not exist. There is a small, maybe 2 person bivvy at about CB09 204 323, or there's camping available at small flats at CB09 206 326 and CB09 207 329. Head of the Fraser Valley • By Yarmoss. Licence: C.
Vast, obvious, scree and talus slopes drop down from Fraser Col. There's nothing for it but to begin climbing. Try and stick to the tussock edge of the slopes early on as the scree is unstable and not easy to climb. Higher up, you'll notice that the initial scree slope is coming from a gully under the eastern side of Emily Peak which towers above. The route to Fraser Col requires crossing the slope and climbing more to the north. If you're here before mid January you will probably encounter snow in the upper reaches of the climb beneath the col and this will most likely require an ice axe to get up. Later on in summer, or if its been a mild winter, it'll just be scree and talus the whole way up. The view from Fraser Col is fair reward for the slog up here. Fraser Valley from Fraser Col • By Yarmoss. Licence: C.
From the top of the col unmarked routes exist which descend the large basin to the north of Emily Peak (Emily Basin) to the western most tributary of Emily Creek which is descended to the Emily Creek bridge on the Routeburn Track between Falls and Flats huts, or it is possible to sidle westwards from Fraser Col beneath the northern face of Emily Peak to reach the rocky gut which is part of the Emily Pass route. Climbing out of the gut leads you to Emily Pass and then a long descent down to Lake Mackenzie. Added 15 December 2017 by YarmossYarmoss. 1 revision 15 December 2017 by YarmossYarmoss. 263 views in the past year (22 per month).